Wolfgang-Felix Magath wasn’t always the sadistic, cheese-toting crank he’s now portrayed as being. A long time ago, before Fulham, Hangeland and the Quarkwickel, he was a footballer. And a very good one at that. For parts of the 1970s and ’80s, he was considered Germany’s finest playmaker, a cerebral presence at the heart of one of Europe’s best domestic sides. This was Hamburg-era Magath: subtle, creative and intelligent, a man the great Ernst Happel labelled “a monastery student”. Yet this unlikely image of Bruder Felix, a benign and thoughtful football monk, flies in the face of the current perception of him as some sort of autocratic OAP with a hatred for lethargy. For when it comes to Magath, a gloomy present masks an illuminated past. The ‘Royal Game’ influenced Magath greatly, becoming a defining element of how he played football, and later, how he managed. The word “control” is significant. One of the basic tenets of chess strategy is “controlling the centre”: it implies that whoever rules the four crucial central squares stands a far greater chance of winning. Control of the centre, and thus overall control, is something Magath has sought relentlessly, whether as a chess player commanding an army of sixteen, a meticulous Spielmacher seeking to dominate midfield, or an overbearing manager demanding obedience from his charges. Yet while the pawns and rooks on a chess board will never disobey the hand that moves them, the same cannot always be said of sportsmen. Unsurprisingly, Magath’s totalitarian lust for control eventually proved his downfall as a manager. But as a player, this hunger for centrality was exactly what Hamburger Sport-Verein needed. Starting in 1976, a succession of HSV coaches made Magath the fulcrum of their team, a grandmaster shaping the moves of his teammates. Magath was plucked from Saarbrücken in the second tier, where he had helped the Saarland outfit to win the league. He’d scored regularly from an advanced position, but upon joining HSV in 1976 season, coach Kuno Klötzer had recognised that the little man’s busy imagination was more suited to the slightly deeper, prompting role that would come to define him as a player. Quickly, Magath became the metronome of Klötzer’s side, and for his performances during that year he was rewarded with a call-up to the West German national team in April. Two months later, he scored the goal that ensured a HSV victory in the Cup Winners’ Cup final, the first of many finals in which he would appear for the club. But the monkey on the back of this HSV generation had always been the Bundesliga. Since the inception of the competition in 1960, HSV had not won the title, and in four seasons at the helm Klötzer had failed to deliver. Ultimately, the coach would pay for this with his job, and he was sacked in the aftermath of the Cup Winners’ Cup win. Yet none of Klötzer’s replacements saw fit to remove Felix Magath from the equation, so integral had he proven to HSV’s development. Rudi Gutendorf, a wandering minstrel of a head coach, soon followed in Klötzer’s footsteps, bound for a career living the good life as manager of powerhouses like Fiji and Mauritius. Arkoç Özcan, Branko Zebec and Aleksandar Ristić all came and went before the arrival of Ernst Happel in 1981, but each elected to stick with Magath at the core. Unquestionably, it was Magath’s determination to exert an influence on the game that kept him at the forefront throughout this chopping-and-changing on the HSV bench. When the managerial merry-go-round destabilised the side, Magath restored equilibrium. His compulsion to view the game strategically made him an on-pitch director, as vital to the team’s style as the head coach. The heavy-smoking Viennese, who’d coached Feyenoord to the European Cup in 1970 and brought Club Brugge to the same competition’s final in 1978, was a manager with gravitas. According to David Winner in Brilliant Orange, he’d won over the Netherlands team prior to steering them a runners-up spot in the 1978 World Cup “by lining up balls on the eighteen-yard line and then striking each one precisely against the crossbar”. When Happel talked, people listened, and Magath appears to have listened very closely indeed, for he became a genuine star of European football during the Austrian’s reign. While at Feyenoord, Happel nurtured Wim van Hanegem into becoming a gifted central commander, and trusted the Dutchman’s vision to ensure his team predominated in the middle. At HSV, Magath was the obvious choice to fill the van Hanegem role. Happel introduced a pressing 4-3-3 that suited Magath perfectly, and he thrived, passing HSV to another Bundesliga title in 1982. That season, HSV scored 95 goals in 34 league games, many of them stemming from the creativity of Magath, who served Horst Hrubesch so beautifully that the “Header-Beast” netted 27 times. The duo combined to score the goal that ended Bayern’s challenge in late April, and from that point the title was all but guaranteed. The only sour note was a 4-0 aggregate loss to Sven-Göran Eriksson’s IFK Göteborg in the UEFA Cup final. The following year, Magath played every single game and HSV retained their title despite finishing level on points with northern rivals Werder Bremen. They were, unquestionably, Germany’s best side, and Magath arguably their best player. But the real story of the season for HSV and Magath was their famous European campaign. It began in East Berlin against Dynamo and finished in the Olympic Stadium in Athens, with Giovanni Trapattoni’s Juventus the opposition. En route to the final, HSV had already visited the same stadium, crushing locals Olympiacos 5-0 on aggregate in the second round. It would prove a good omen for the Germans and for Magath in particular. Although HSV had lost out in their previous two European finals, Magath made sure that it would not be three in a row. Happel had switched things up, moving to a more asymmetric formation for the contest with Juve; most notably, Lars Bastrup was switched from left to right to pin down Antonio Cabrini. Claudio Gentile followed Bastrup, under strict instruction from il Trap to man-mark the Dane. Importantly, that left a gap on Juve’s right, “through which Felix Magath ran to score the only goal of the game”, as described by Jonathan Wilson in Inverting the Pyramid. Wilson’s description understates one of the all-time best European Cup final goals. Picking the ball up about thirty yards out, Magath feints past a jumping Roberto Bettega, scampers to the very corner of the penalty box and unleashes a curving shot that dips just under the crossbar. “Dino Zoff,” exclaimed match commentator Barry Davies in the aftermath, “didn’t smell it.” With a moment of pure inspiration Magath had won his team the European Cup. But the Bundesliga-European Cup double of 1983 proved be the last major trophies HSV would ever win. In the last thirty years, the only honour worth its salt won by the club was the 1987 DFB Pokal, the final flourish of the Happel era. 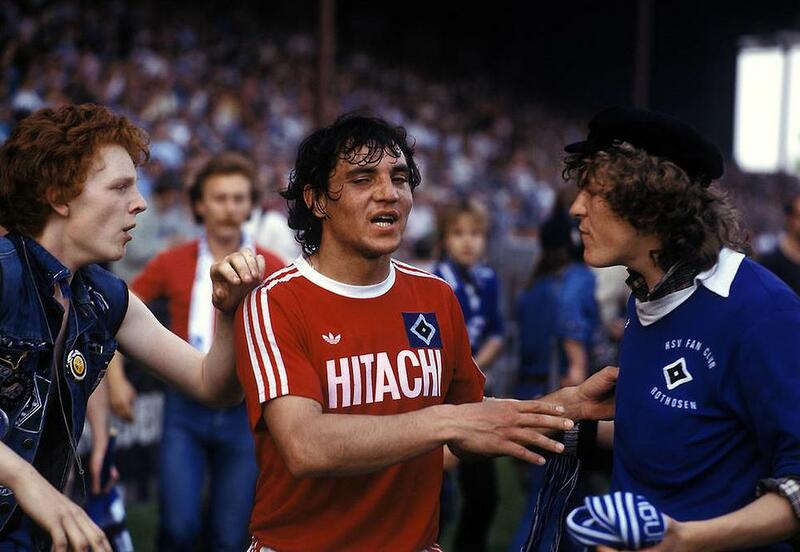 Magath was essential to HSV’s golden age, perhaps less appreciated than Happel, Hrubesch, Kaltz or Keegan, but no less talismanic. He was virtually ever-present in the league from the time the Austrian took over, playing a part in 157 of the 170 Bundesliga matches from 1981 to his retirement in 1986. Through it all, he had controlled the centre. For all Magath’s madness, his prominence in one of Germany’s finest sides makes him a man worth a second look. Admittedly, it can be difficult to square that figure with the one laughed out of Craven Cottage and seemingly despised across the entire continent of Europe. Three decades on from his greatest moment, memories are fading; even those old enough to remember the “good” Magath will have spent most of their lives with “Quälix” rather than Felix. There seem to be two sides to Magath’s modern-day persona but it’s hard to know which is real and which is not. Is he the cute old man with the hamster grin and the friendly smile or the despot intent on estranging all those that cross his path; the gifted creator or the destructive manipulator? Magath, perhaps, has not yet realised that.